MUMBAI/BENGALURU (Reuters) - Facebook Inc's WhatsApp is rolling out a global test measure to rein in messages forwarded by users, the messaging app said, after the spread of rumors led to several killings in India and sparked calls for action from authorities. Violence triggered by incendiary false messages in India, WhatsApp's biggest market with more than 200 million users, has spurred government demands to prevent circulation of false texts and provocative content and caused a public relations nightmare. "We believe that these changes - which we'll continue to evaluate - will help keep WhatsApp the way it was designed to be: a private messaging app," WhatsApp said in a blog post on Thursday, announcing its worldwide test of limits on forwards. "This change is going to make it difficult for people to forward messages, it's going to add a layer of friction to the process," said Nikhil Pahwa, a co-founder of advocacy group Internet Freedom Foundation. 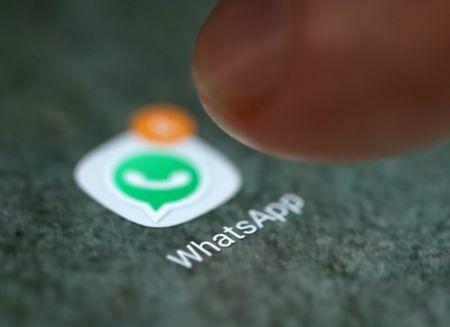 India's technology ministry, which had already this month demanded that WhatsApp rein in misuse, said in a statement late on Thursday that it wanted more effective measures to ensure accountability and ease law enforcement. "When rumors and fake news get propagated by mischief mongers, the medium used for such propagation cannot evade responsibility and accountability," it said. "If they remain mute spectators they are liable to be treated as abettors and thereafter face consequent legal action." WhatsApp has been told the issue is very serious and "deserves a more sensitive response," it added. Responding to the ministry's earlier call, WhatsApp had rolled out a new feature to label forwarded messages and alert recipients that the sender had not created the message.